Imagine a path where the ghosts of Wild Bill Hickcock and Calamity Jane still roam; where bicyclists, hikers and horseback riders can explore spruce and ponderosa pine forests; and the very young, the very old and people of all abilities can enjoy. The George S. Mickelson Trail, in the heart of the beautiful Black Hills, was completed in September of 1998. 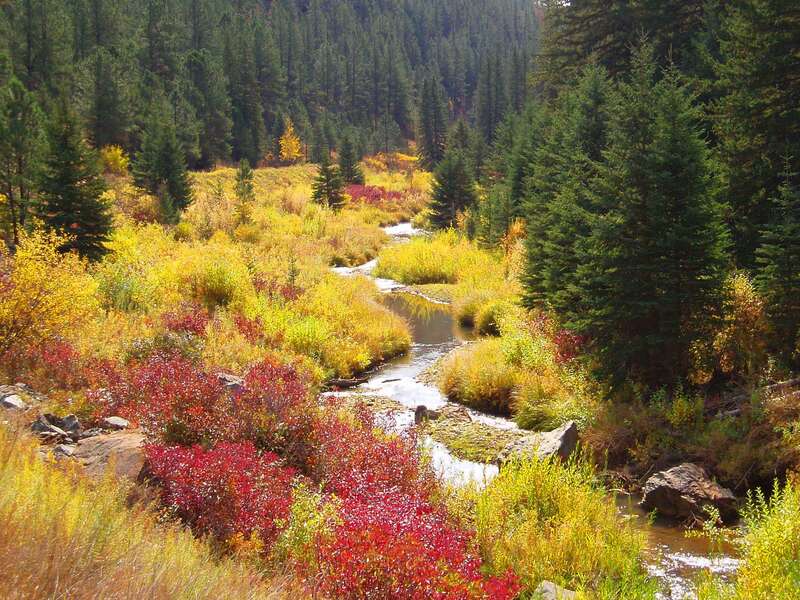 Its gentle slopes and easy access allow people of all ages and abilities to enjoy the beauty of the Black Hills. Much of the trail passes through National Forest Land, but there are parts of the trail that pass through privately owned land, where the trail use is restricted to the trail only. A majority of the trail does not exceed a 4% grade, but parts of the trail are considered strenuous. Dumont is the highest point and the 19 mile stretch from Deadwood to Dumont is the longest incline. Bicyclist cruising by the Crazy Horse mountain carving. It's a work in progress that all trail users can see. Photo by Brooke Smith. Riders on the 15th Annual Mickelson Trail Trek had quite the adventure. They weren't expecting to kick up so much dust! Photo by Brooke Smith. The George S. Mickelson Trail has beautiful fall colors. Photo by Brooke Smith. The George S. Mickelson Trail is good for all bicycle styles and rider abilities. Photo by Brooke Smith. Volunteers work hard to get 575 bicycles parked during the 16th Annual Mickelson Trail Trek. Photo by Brooke Smith. A family of bicyclers are enjoying the George S. Mickelson Trail. Photo by Brooke Smith. Trolls aren't just for fairy tales! A bridge Troll is helping to raise money for resurfacing. Photo by Brooke Smith. Harley Noem receives Certificate of Introduction to Rails-to-Trails Hall of Fame from Linda Mickelson Graham. Photo by Brooke Smith. 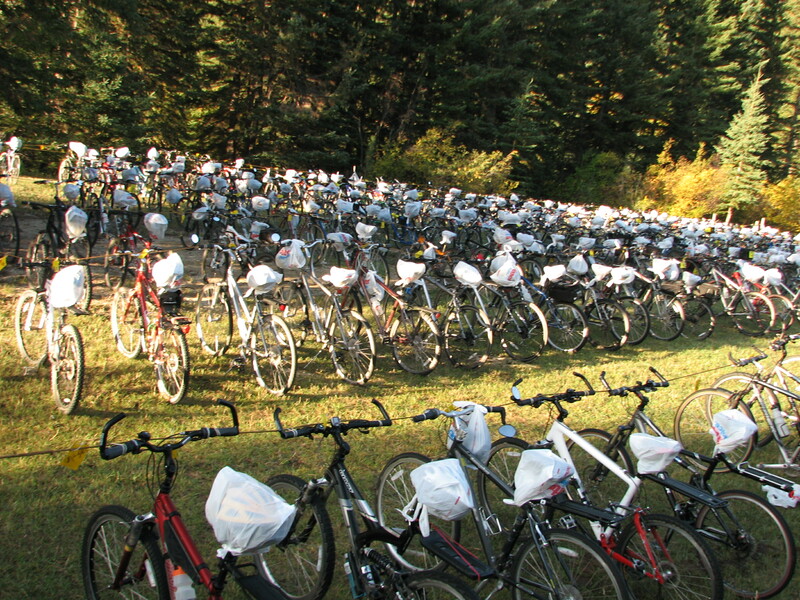 Bicycles lined up along the fence at Pringle. One of the Trailheads along the Mickelson Trail. Photo by Brooke Smith. A very dedicated, cold Trail Patrolman. Photo by Brooke Smith. Riders of the Trail Trek coming through Sheep's Canyon and it's rock formations. Photo by Brooke Smith. Just a few Trail Trek bikes! Photo by Dana Garry. Fall colors on the George S. Mickelson trail. Photo by Lisa Sabers.